Moving the collection again ! now it did not seem much but if you shake anything long enough and there’s going to be cause and effect a choice I wasn’t going to gamble with but what do we do ? We’ve already moved home  set up shop and more to the point where’s the room, a decision was made to trade the bedroom for the front room and all becouse we spoil our daughter and gave her a very illogical choice of what room she wanted and of course choose the largest room. To get the pieces to stop shuddering I created a day where I’d be pumped and ready to do a days double graft, it’s not that I do not have company or help but if anything was to break I’m solely responsible plus I wouldn’t want others feeling bad if an accident was to happen, the daunting prospect gave me dread but I still started. I take our little bedroom apart move all our belongings into our daughters room and proceeded to get each of the cabinets into the small room, with a nice snug fit every one ☝️ of them fitted till there was no wall left only the door  could be seen, no cats  around my pieces door kept shut it was all going ok  until we realised a bed in the front room was not only a look of laziness but all felt awkward when visiting. I would have appointments that felt weird with the situation and any females that came round were given the opportunity to meet in the cafe downstairs, I was of course trusted everytime but even my CPN expressed the notion of a proper bedroom and have the front room back as it’s feature for relaxing  and entertaining too. Guess what that achieves! 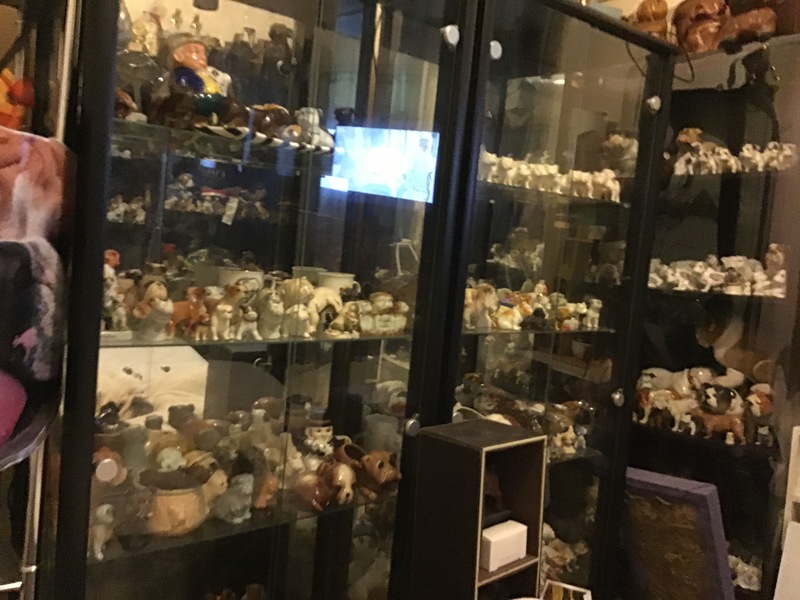 That’s correct I now have to Move the collection YET AGAIN OMG ! 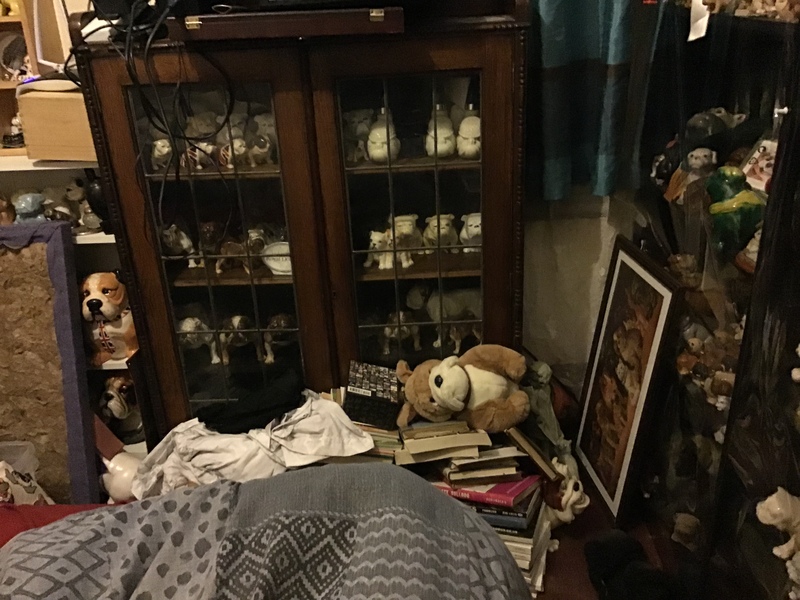 So just before Christmas 2018 my daughter came home from collage and found her massive bed gone and all her bed room pieces were now not in her very large room shock horror was her expression. 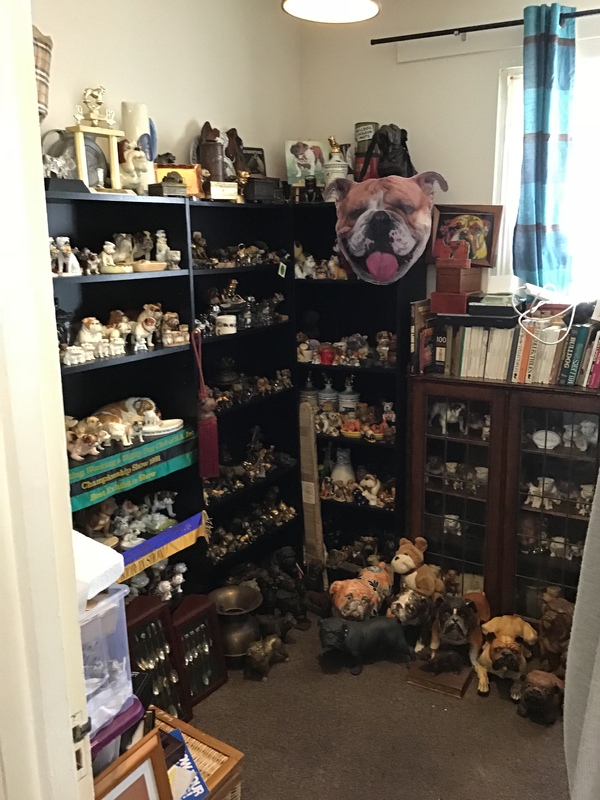 No way are you moving the collection AGAIN! Yes i I had pretty much got a plan in my head and executed it whilst everyone was out I again took down everything all the bulldog memorabilia the pottery basically everything and then moved the cabinets into the larger room, the problem here lies with the fact I need to get a double bed in too as well as fighting uneven floor surfaces. Yet again i did it i I do not know how I can move a collection which really is a job for two persons but I just get on with it until either I’ve had enough for the day or my task has been completed, the collection now sits all around our largest room with our bed basically in the middle with some wall for the head board, we then kitten  proofed Our investment with laminated plastic which till now has worked great . Very fortunate to have a dr like Dr Martin I have real issues trusting men after my father’s physical abuse as a child and it’s taken years for him to build up trust with me, so when I now walk into the room after knocking he says “have you been overdoing it again” knowing full well I’m in agony a few days after I’ve moved the collection. Ive damaged my back my wrist and a few other woes and the Dr expressed that as I’m not 17st anymore I don’t have the power or weight behind me to be doing the job of two grown men I’ve permanently damaged my rib cage cartilage and have been given a powder type medication to take when the pain is unbearable, this is an old wound though that first started through stress in jan of 2018. The moved collection does look good in our room if you were to cover the bed it would look just like an antiques shop but just with what looks like cheap glass (I’m referring to the laminate plastic) there’s room to safely move about and I can wake up every day looking at all the things I love in life (including the wife) I’ve done well and feel it now. It states two persons in the headers ! 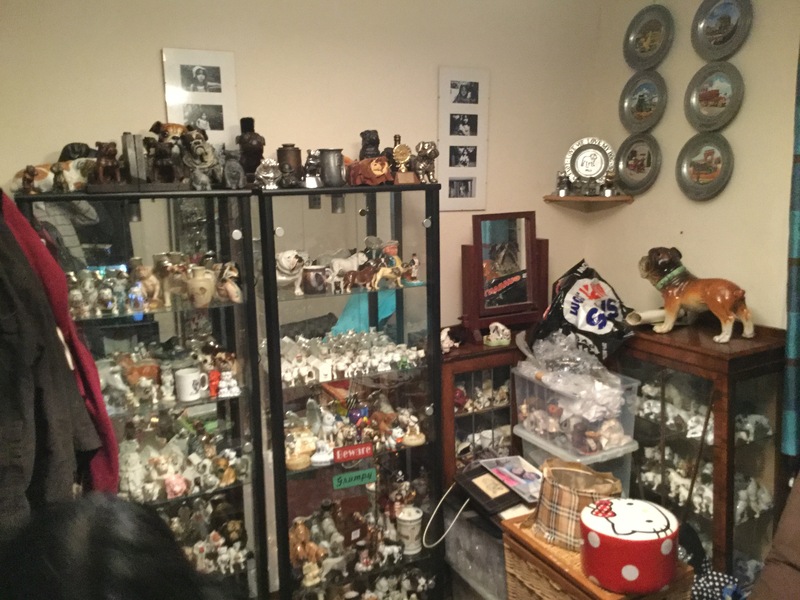 PLEASE DO NOT COPY ME OR ANY OF MY MOVING METHODS ITS IMPORTANT THAT IF YOUR MOVING SUCH A PROJECT YOU FIRST ASK FOR HELP, SECONDLY PRE PLAN MEASURE AND MAKE SURE YOU HAVE NOT GOT YOURSELF STUCK THE LAST THING YOU WANT IS TO PUT IT ALL BACK AGAIN. Even though I’ve even physically busy I’ve also put out new content since Christmas  these articles need viewers repeat visitors and comments that will help us gain a foot 禮 hold online in 2019, the blog articles are varied but there’s one that too me really sticks our so please link to when you get the chance. PLEASE CHOOSE COPY AND PASTE INTO YOUR SEARCH BAR IT HELPS TO RANK BETTER WHEN BEING SEARCHED FOR !